5-6-2015 The Man in the Walls! Today we have an extra mysterious blog, because today we are talking about: El Duende! 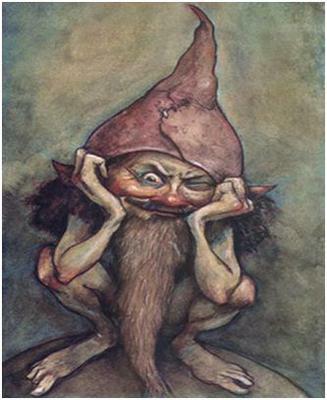 El Duende is a tiny creature that can be classified as Fairy, Goblin, Leprechaun or Gnome-type thing. Duendes are a myth in Bolivia, and much of South America, that refer to small men that live in people's walls, mostly in the walls of children's rooms. They sometimes watch the children or even steal the belongings of a child. It is said that they watch children while they play ball outside and sometimes will attempt to trick a child's parents into giving the child to them so they can eat him/her. (Rumple Stiltskin was possibly a Duende as he attempted to trick a child's mother into giving up the baby.) They are commonly described as being short with a large sombrero (hat) and long robes. Another more creepy myth about Duendes is that they will clip the toenails of children in their sleep, sometimes clipping of the entire toe. (Yuck!) Image Source. So that's the weird and creepy Duende. There are many myths about El Duende taking money, stealing children, getting into all kinds of mischief and scaring kids and parents half to death. So here's a question: what types of myths does your country have?